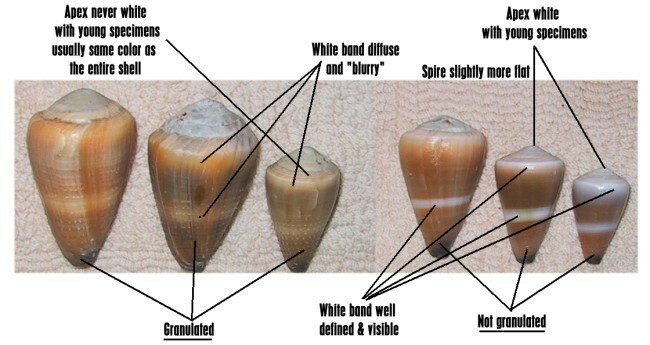 This article is mainly dedicated to cone shells beginners and to amateur who never paid a real attention to those common shells. 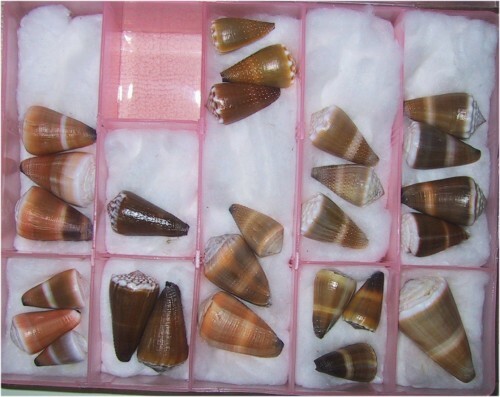 When you start diving to collect your own shells from the Indo-Pacific Ocean, you will often begin by finding common species, and in many cases, you'll probably pick up Conus lividus, Conus frigidus, Conus sanguinolentus, Conus flavidus and maybe Conus muriculatus/sugillatus, Conus moreleti, Conus glans. Even cleaned, those species can be difficult to identify and while you snorkel, it can become a real nightmare ! Those species can have crusting algae and corals covering them and many times you can only see the aperture of the shell ! 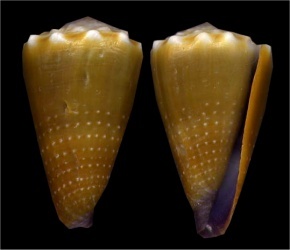 Those shells are most of the time scratched, because they usually do not burrow and lay often close to the reef where the wave action is rough. An incredible mess… but with time, all those will be correctly identified. This suggestion for identification is personal and not based on any book nor information. I base this article on my field experiences and if you have things to add to it, I shall surely add it to this page. Do not hesitate to send me an e- mail ! Here is a short description of habitats, rarity, and general things to know about these species. Then you'll find pictures and explanations helping to identify them and tips to be able to separate them while diving. It might be the most common on the list. It can be found almost anywhere. Those coming from the reef are often a little different from the ones found in the calm waters close to the shore. 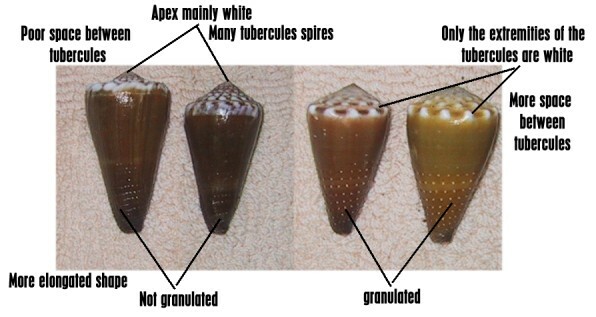 Those from the reef are often smaller and are corded/granulated whiles the others are bigger, have a smooth pattern and have less scratches. 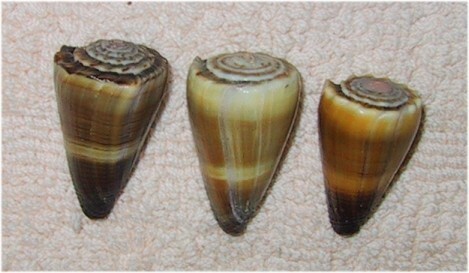 From this list, Conus lividus is the one which can reach the biggest size. 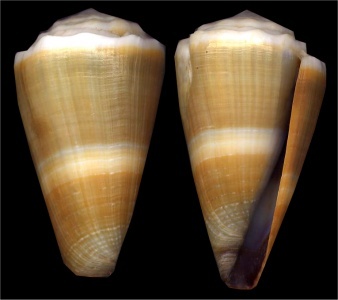 In the Seychelles (Idian Ocean), Conus flavidus is very different from C. frigidus and can be easily distinguished. 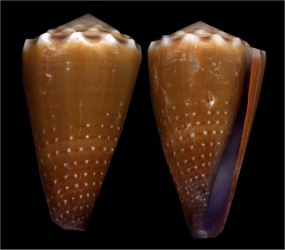 Those shells are sometime separated as different species and sometime Conus sugillatus is considered as a form of Conus muriculatus. It depends on the authors and collectors. In this article I shall not separate them. 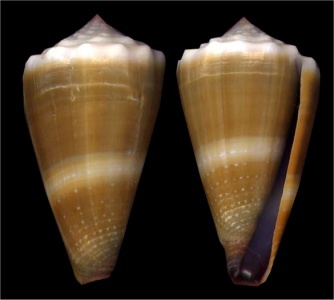 However, these species are really different from the others but are often classified as Conus lividus. 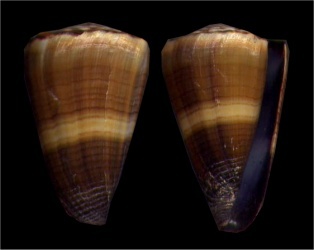 Conus muriculatus is much smaller than C. sugillatus, and is often corded/granulated & crowned while Conus sugillatus is smooth and reach much bigger sizes. 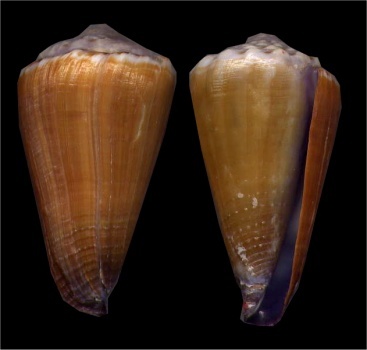 Anyway both are very different from Conus lividus and its related species. 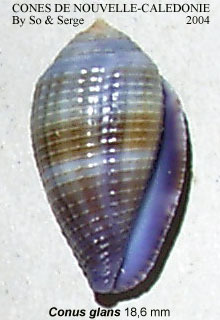 Those can be considered as uncommon to rare species. 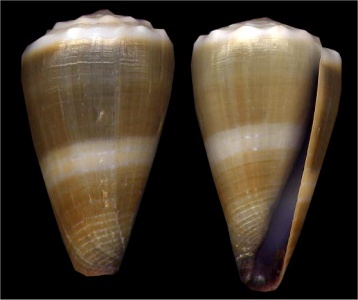 I will only compare Conus sugillatus though, C. muriculatus is a very small shell around 20mm and so not comparable to the species listed before and below. This is my favourite with C. sugillatus. 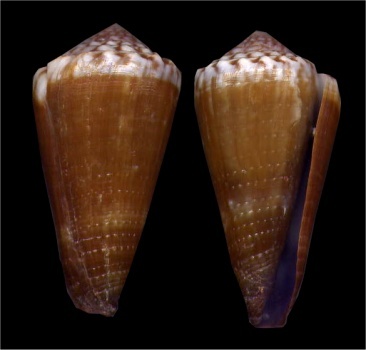 Conus moreleti, also an uncommon to rare specie. 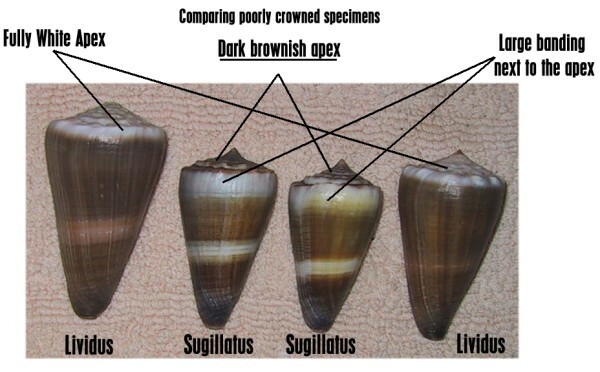 It is really close to Conus sanguinolentus, and only accurate eyes may makes the difference while snorkeling. 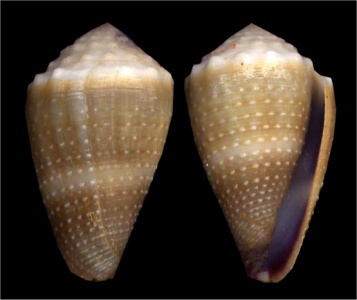 It is most of the time covered with crusted algae just like Conus sanguinolentus and lives close to the reef. 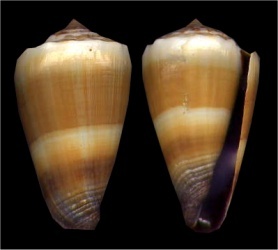 Even if it is more elongated and has different aperture color and a darker animal, it can be easily spotted as a common Conus sanguinolentus. 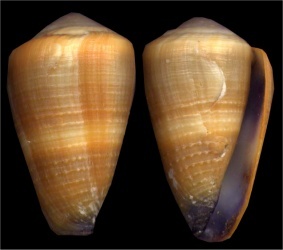 This rare specie can sometimes be named as a juvenile or small Conus frigidus. 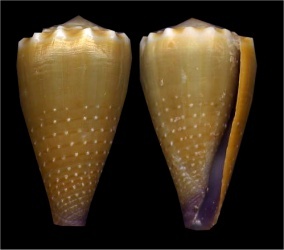 It has a polymorphic shell which can also be close to the rare Conus tenuistriatus. 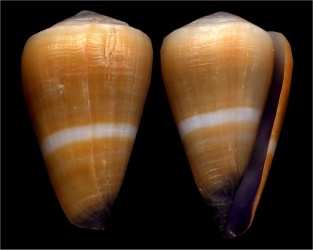 When it is close to C. frigidus, it is corded/granulated and has the same global color, but size and shape are different. 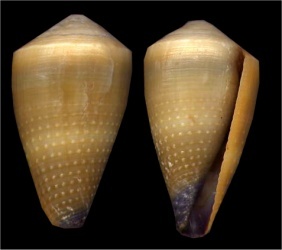 It is a very small shell and it is more "ventricosely conical". 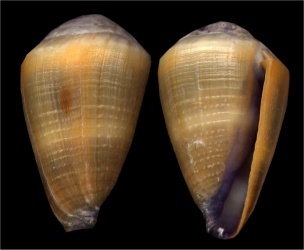 And it is a small shell often around 15-25mm. This is the most difficult part. 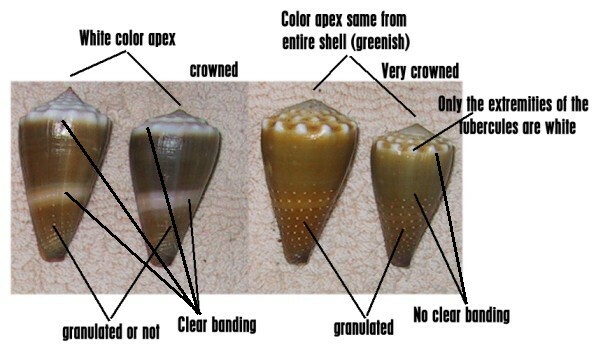 First if you see many shells grouped, they might be common and should not be considered as Conus moreleti & Conus sugillatus. But you could find a locally good spot with those uncommon ones though. 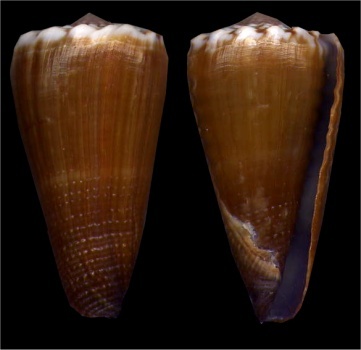 If the shell is full of crusted alage, try to get rid of part of it by hitting the shell with someting like a knife. 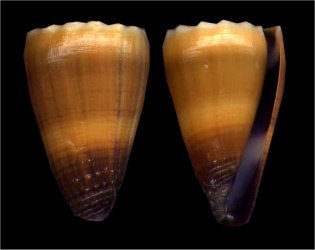 Then if you see a crowned spire, then you are in front of C. lividus, C. sanguinolentus or C. moreleti. 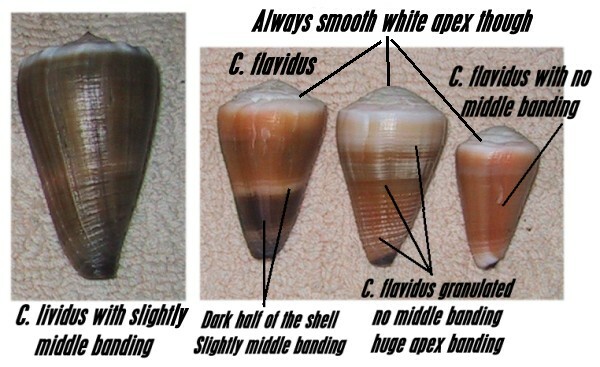 If you see no banding, no granulations and if the shell is elongate, dark, the animal very dark and a narrow aperture, not regular with a nice and dark violine color you might have Conus moreleti. 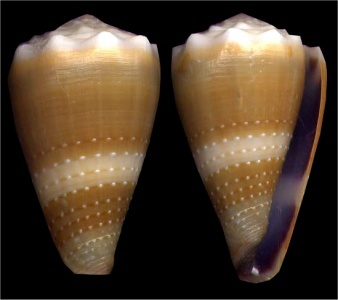 If you see a banding then it is Conus lividus. 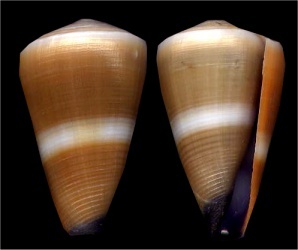 If you see no banding but with granulated shell then it is Conus sanguinolentus. 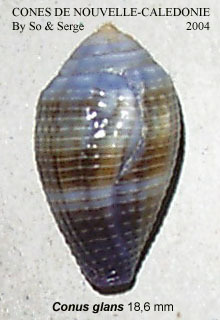 If the shell has a smooth spire, and is dark with no bandings it is C. sugillatus. 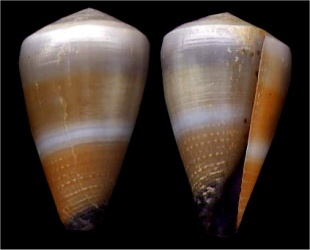 If it has white spire and banding, without any granulations, then it is C. flavidus. 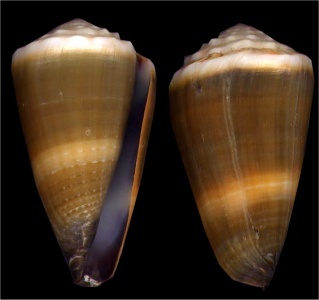 And it is granulated, with a discret banding it may be C. frigidus.